Elegant and chic, this flower bouquet is laced in lavender to send your love, kindness, and gratitude to your recipient this spring season. 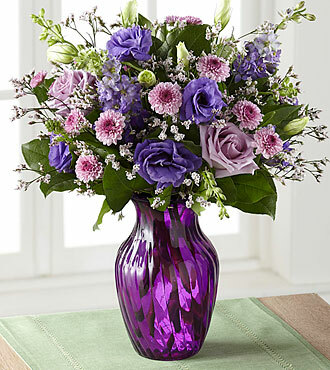 Lavender roses and purple double lisianthus flaunt their twilight inspired beauty, mingling amongst purple button poms, purple larkspur, pink limonium, and lush greens, presented in a purple swirled glass vase. The perfect thank you, birthday, or Mothers Day gift.